Can be used to revise any course material. Adapts itself to all levels. Allows the teacher time to move around the class engaging with students. This activity is particularly suited to large classes of false-beginner to pre-intermediate students in compulsory education, from Junior high school to university, because it is a fun and non-threatening activity that requires the participation - in English - of all players. One sheet of A3 or B4 paper per two to four students. Coloured pencils/pens. Textbooks/course materials. Dice. Optional: Examples of board games (see Appendix). Board-game templates (see Appendix); a short list of quiz questions for low-level students. Depending on the students' English ability, teachers should be prepared to explain procedural details in the students' L1 in order to make sure they understand exactly what is expected of them. 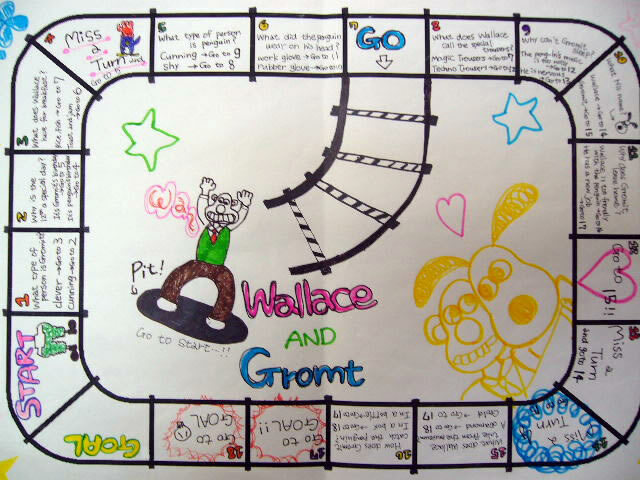 Depending on how much time is available, teachers may also wish to prepare board game templates beforehand, either for the students to use, or just as examples. For low-level students, it is also a good idea to prepare a list of questions for them to include in their games. This will require 90 to 120 minutes, depending on how much freedom and time students are given to design their games. Students spend the first 50 minutes (of a 90 minute lesson) preparing the games and the remaining time playing their classmates' games. Explain to the students that they are going to be reviewing the materials they have studied this semester/year, and that they are going to do this in a fun way, by designing and playing a board game. Explain the timetable for making the games (see above). If you have some sample games, pass them around the class for the students to see. I have included a link to two examples of games in the appendix. Explain that there are four issues that the teams have to think about in designing their board game. 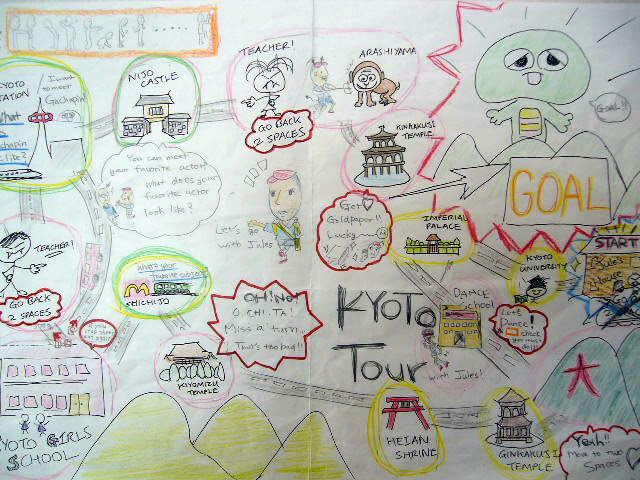 Themes I have encountered in the past include local sightseeing tours, cartoon/manga characters, stepping stones across piranha-infested rivers, even a journey through the human digestive system (not for the squeamish!). If you have prepared some board-game templates, show them to the students and tell them that they are welcome to use them. Templates are easily created, or can be found with a Google search. Tell the students that their game must have a start and a finish and 'x' amount of questions. I recommend 12 as a bare minimum. Good board games have a system of rewards and penalties. Write some of the following better known ones on the board as examples. Write examples such as the following ones on the board. Name three things you did last weekend. Discuss with the students the fact that the first question works better as a quiz question because it is more challenging to answer, it requires more use of English, and it is more interesting. Encourage students to come up with these types of open-ended questions. Write on the board the units of the textbook (or other material) that you have covered recently and encourage students to use these resources so that the games will be a useful review and consolidation activity. Tell students to assign roles in their groups. In a group of three, for example, one group member can take care of the design, one can devise rewards and punishments, and another can write the questions down on a second piece of paper before copying them onto the board games. Explain that it is important for everybody to work together to produce a good game so that their classmates can enjoy playing it. Students prepare their games. In some of my classes, students tend to be more interested in the design of their game than in including relevant questions, so they may need gentle encouragement to focus on questions. As students work on their games, you may wish to circulate more examples of board games - student-made or otherwise - to provide them with inspiration. Many ESL/EFL textbooks include board game-style activies and these too can be used as a reference. If the time to play is approaching but students still don't appear to have enough questions, you can hand out a list of supplementary questions or write up a list on the blackboard for the students to use. More advanced students can write a set of rules to accompany their game. Students share their games and play them. In large classes there will be a constant supply of new games to play, and lots of of reinforcement of the material being reviewed. I usually rotate the games roughly every five minutes. Complaints about not having enough time to finish are soon forgotten as students wonder excitedly about what lies in store for them with the next game! In groups, students can decide which game was their favorite and think of three reasons why they like it. This can be done as a class discussion or as a short writing report to end the lesson on a quiet note.